A Girl named Gay: Who's Got a Stapler? Do you want to know a secret about Dallin B? He's a chronic nurse goer. He goes for headaches, scratches, falls, eye-sight issues, tummy irritations, etc etc. I was SHOCKED when I found this out. He's an easy-going, tough kid at home so I didn't think these excessive nurse trips fit the bill. I'm also learned through trial and error- mostly just error- to not be so shocked and to most importantly not devalue his "incidents". "What, mom. You think I shouldn't go to the nurse when I fall and break my knee? Fine, I'll just never walk again." We're going to file this one under the category of Agree to Disagree. Actually, it's a silent agree to disagree. Because in reality, I've decided to just audibly agree with him. For relationship purposes, of course. So when I saw the nurse's number pop up on my phone, I was probably shaking my head- with a smile!- before I even answered the phone. Because make no mistake that this is all pure comedy. This time she was calling with the announcement that my son was in her office with a head injury. 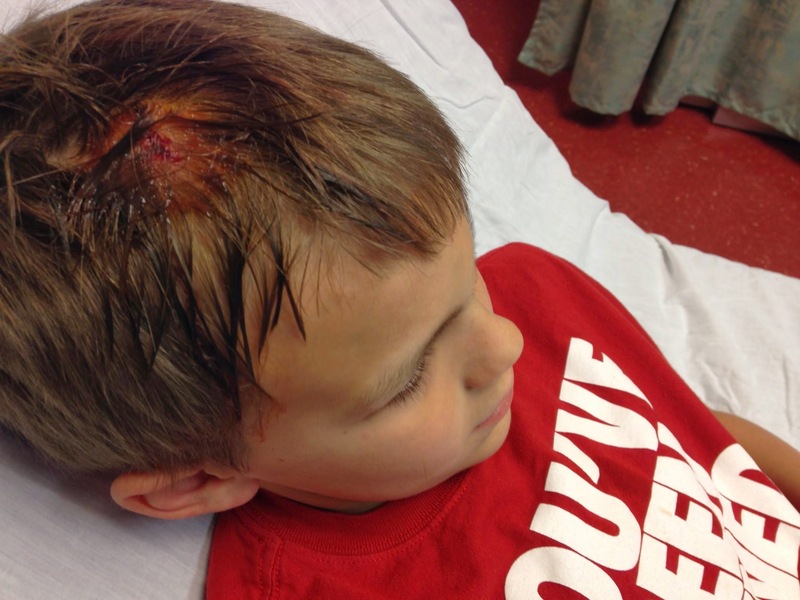 Something about the playground and tag and hit his head and lots of blood. I listened and asked her what she thought needed to be done. She said she wanted to get it cleaned up a bit more but she was pretty sure that he needed to be taken to a doctor. 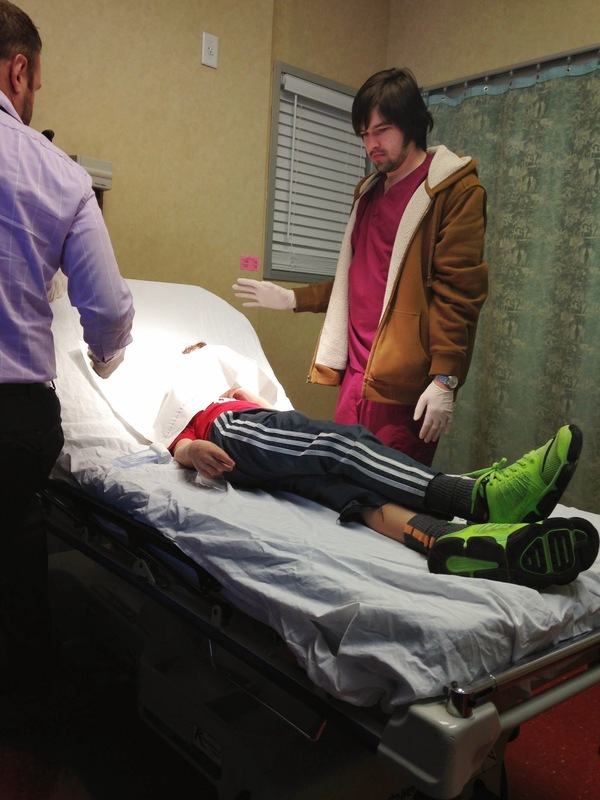 And since I do trust the nurse, and we have been a few rounds together where honesty- real honesty- was spoken (our most recent conversation had been about a possible concussion….that I was pretty sure wasn't a concussion…), I knew this was a legit incident. Now let me take this time to tell you that this would be my first time dealing with lots of blood and head injuries and possible stitches/staples as a mom. I mean, you know how you feel like there are milestones that make you a real mom? Well, I kind of felt like this was one of them. 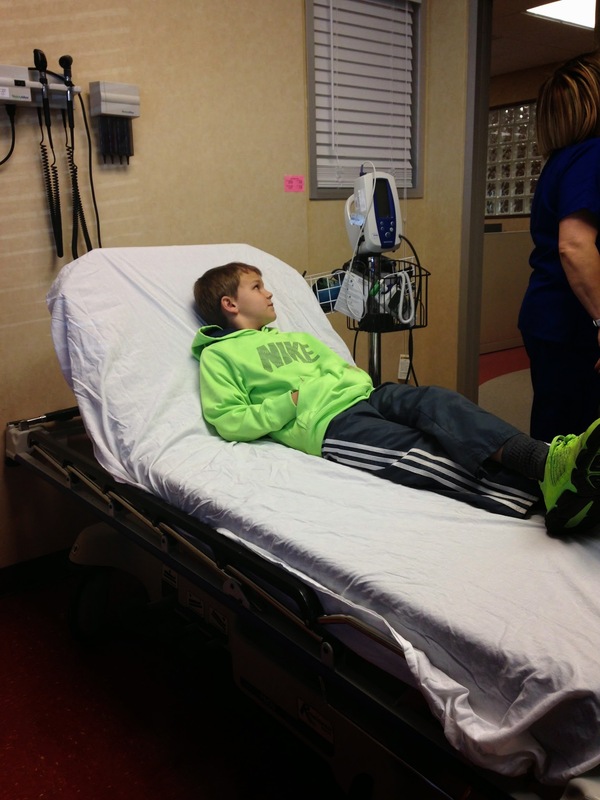 When I got to the school, the nurse walked Dallin out. In true form, he was calm, cool, and collected. His head was cleaned. There was no dripping blood, no crying, essentially no drama. We walked out to the car, and I thought, "My gosh, if this is how head trauma and stitches scenarios go, I've got it in the bag!" I mean, easy peasy. I dropped the other kids off at a friend's and went to deal with getting him sewn up. They concluded that staples was the way to go. 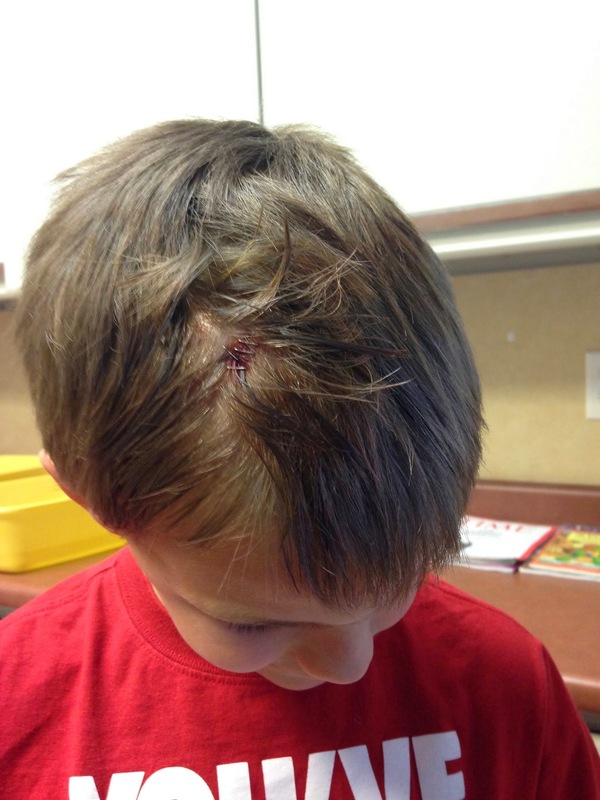 The doctors put some monkey blood on the injury and put 6 staples in B man's head. He was good to go! 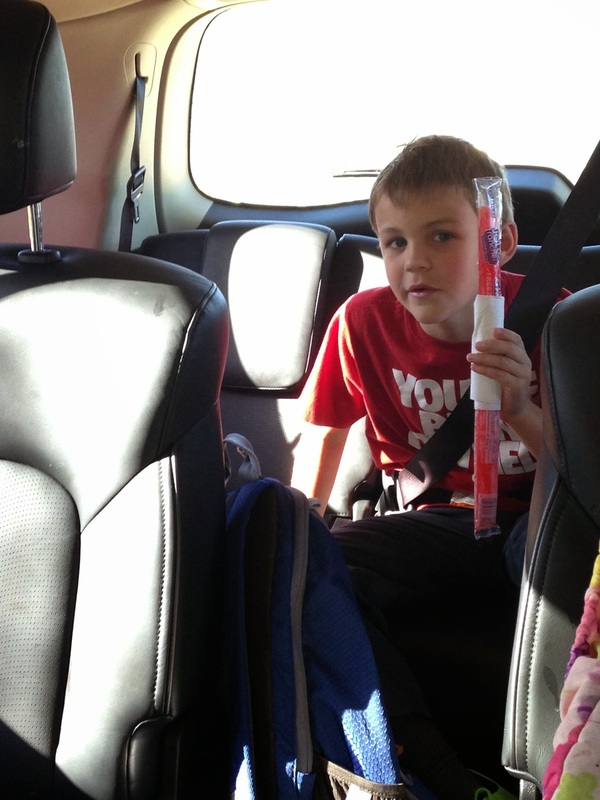 His reward was the biggest Otter Pop I've ever seen in my life. He handled the whole situation like a pro and was back on the basketball court the very net day…so much for taking it easy! We all took him to get the staples taken out. These are the kind of family events we enjoy, ya know! That Dallin B really is a good kid! Among his many petty trips to the nurse, he manages to squeeze a real headbanger in there every now and then!